Also known as "walkabout", these performers are fabulously dressed in original costumes. They are roaming jugglers, hula hoopers and animators and can provide ambiance and break the ice at any type of event. 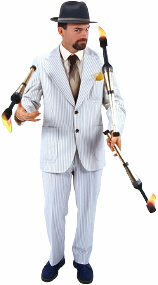 Also check out our stiltwalking page. This walk-about entertainment is great for large and spacious events or festivals where there is the need for entertainment that is not on a stage. Hula hoopers can circular throughout the events providing mini shows and walk-about tricks to entertain crowds or line ups. Balls, clubs, fire torches, knives, food, hats and even small children (just kidding). We can provide roaming juggling to provide your event with that "feel-good" circus atmosphere. To book our jugglers Contact us. To view pictures of our costumes, visit the gallery pages.